1873 Indian head penny value continues the run of scarce early years. Its value is well above the commonly found pennies from 1890 onward. As with all old coins, condition is very important to value. It is collectors seeking the best quality for their collections creating the demand for high condition Indian pennies. Your 1873 penny is a nice find in any condition and highly collectible if not heavily worn. Higher value is placed on coins with finer details remaining in the design. Wear to the surfaces is judged by dealers and collectors and different "grades" are assigned depending on the amount of wear. For example, if you can recognize hair curls just below the headband it indicates a better quality coin and higher 1873 Indian head penny value. 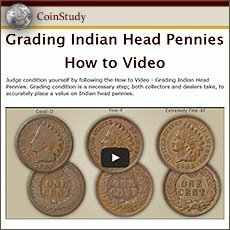 Grading your Indian penny is covered in greater detail below. Also, adding 10% to its value is an easily recognizable variety. Specialist of the Indian penny series have identified two different "3’s" used in the date. First determine the condition of your coin, then below that section are images to find the variety of 1873 penny you have. 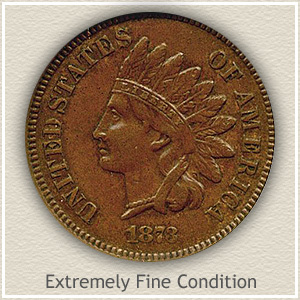 1873 Indian head penny value is about 10% higher for what is known as the "Close 3" variety. 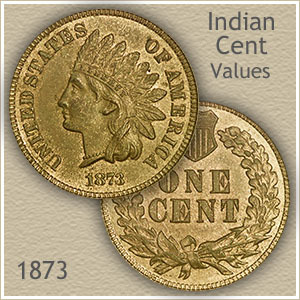 Specialist collecting Indian pennies have recognized two varieties of the 1873 and both are considered necessary to complete a collection. The attention is centered on the "3" of the date. Two distinct appearances of the "3" in the date were minted. When compared side by side the difference in the "3" is clearly seen. The spacing forming the opening of the "3" is quite narrow on the "Close" variety and clearly wider on the "Open" variety. Not to be overlooked are these subtle differences in both the appearance of the date and your coin's overall condition. 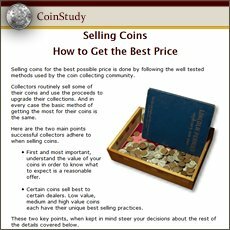 How much an 1873 penny is worth involves an added insight to judging these accurately. Open "3" values are listed above. Figure how much the rarer "Closed 3" variety is worth by adding 10% to these values. Wear on a coin’s surface as it circulates shows on certain parts of the design. Follow the progression of this wear in the images and descriptions. By identifying the amount of metal that has worn from your penny leads to greater accuracy in its value. Uncirculated: Desirable because no wear disturbs the surface. This penny despite its age is in like new condition and rising to the high end of 1873 Indian head penny value. Toning may appear as a dark redness and brown, however no parts of the design have been worn from contact. With a magnifying glass examine her cheek and the tips of the feathers for wear. Minting imparts a certain grain to the surfaces of coins, wear can appear as a somewhat glossy or smooth area and sometimes with dullness to the area. Extremely Fine: 1873 pennies found with crisp, sharp detail are uncommon. 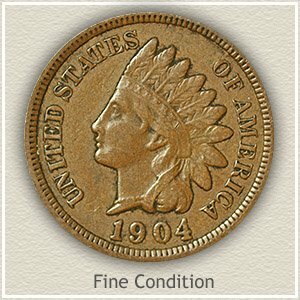 Clear definitions of minor design elements are Indian pennies graded as "extremely fine" condition. First determine if the top and bottom of the headband is well defined. This plus all of "Liberty" clearly visible puts your coin in a select group worth a strong premium. Next, her eye brow and cheek should show almost complete roundness with only small areas of flatness. Confirm the extra fine grade with a distinct ribbon crossing over the hair curls behind her neck. 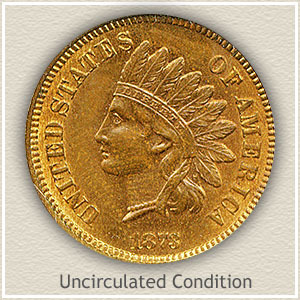 Good: Worn to a shallow relief with little detail remaining describes a coin in "good" condition. The area surrounding the eye is slightly defined. Just visible is a separation of chin and neck. The headdress and feathers are worn smooth showing just an outline. Although the lettering and date are heavily worn they should be separated from the rim. 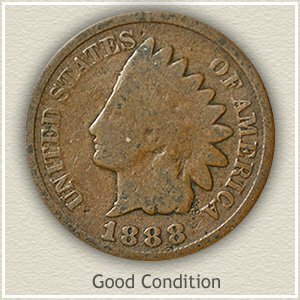 Your 1873 Indian head penny value may be at the low end of the scale but because of its history they remain an important coin.